CHAMPAIGN, Ill. - The pen may have bested the sword long ago, but now it's challenging wires and soldering irons. University of Illinois engineers developed a pen with conductive silver ink that can write electric circuits and interconnects directly on paper and other surfaces. University of Illinois engineers have developed a silver-inked rollerball pen capable of writing electrical circuits and interconnects on paper, wood and other surfaces. 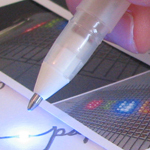 The pen is writing whole new chapters in low-cost, flexible and disposable electronics. Led by Jennifer Lewis, the Hans Thurnauer professor of materials science and engineering at the U. of I., and Jennifer Bernhard, a professor of electrical and computer engineering, the team published its work in the journal Advanced Materials. "Pen-based printing allows one to construct electronic devices 'on-the-fly,' " said Lewis, the director of the Frederick Seitz Materials Research Laboratory at the U. of I. "This is an important step toward enabling desktop manufacturing (or personal fabrication) using very low cost, ubiquitous printing tools." While it looks like a typical silver-colored rollerball pen, this pen's ink is a solution of real silver. After writing, the liquid in the ink dries to leave conductive silver pathways - in essence, paper-mounted wires. The ink maintains its conductivity through multiple bends and folds of the paper, enabling devices with great flexibility and conformability. Metallic inks have been used in approaches using inkjet printers to fabricate electronic devices, but the pen offers freedom and flexibility to apply ink directly to paper or other rough surfaces instantly, at low cost and without programming. "The key advantage of the pen is that the costly printers and printheads typically required for inkjet or other printing approaches are replaced with an inexpensive, hand-held writing tool," said Lewis, who is also affiliated with the Beckman Institute for Advanced Science and Technology. The ability to create freestyle conductive pathways enables new possibilities in art, disposable electronics and folded three-dimensional devices. For example, the researchers used the silver pen to sketch a copy of the painting "Sae-Han-Do" by Jung Hee Kim, which portrays a house, trees and Chinese text. 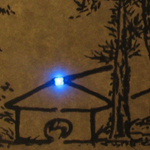 The ink serves as wiring for an LED mounted on the roof of the house, powered by a five-volt battery connected to the edge of the painting. 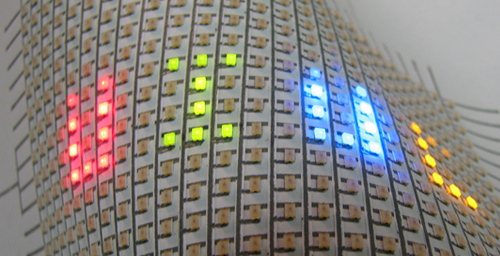 The researchers also have demonstrated a flexible LED display on paper, conductive text and three-dimensional radio-frequency antennas. Next, the researchers plan to expand the palette of inks to enable pen-on-paper writing of other electronic and ionically conductive materials. The U.S. Department of Energy supported this work. Co-authors were graduate student Analisa Russo and postdoctoral researchers Bok Yeop Ahn, Jacob Adams and Eric Duoss. Editor's note: To contact Jennifer Lewis, call 217-244-4973; email jalewis@illinois.edu. The paper, “Pen-on-Paper Flexible Electronics,” is available online.